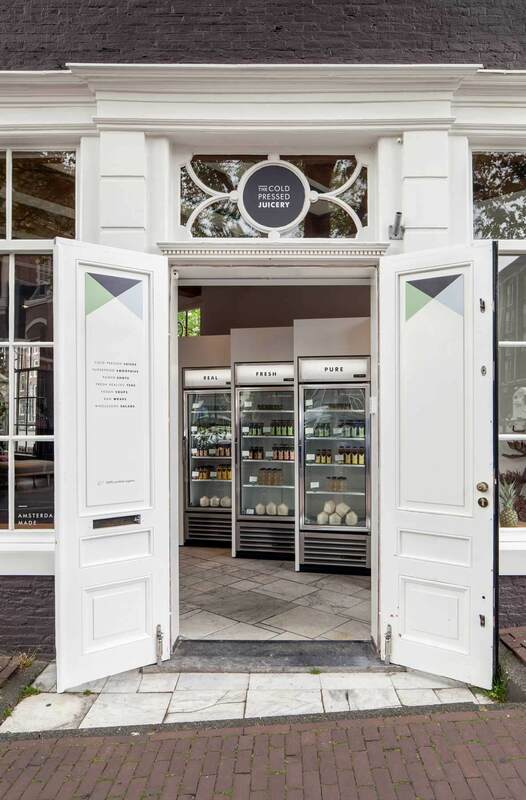 After the successful completion of the first and second design for the Cold Pressed Juicery at the Willemsparkweg and the Herengracht, Standard Studio got asked to create their third store. 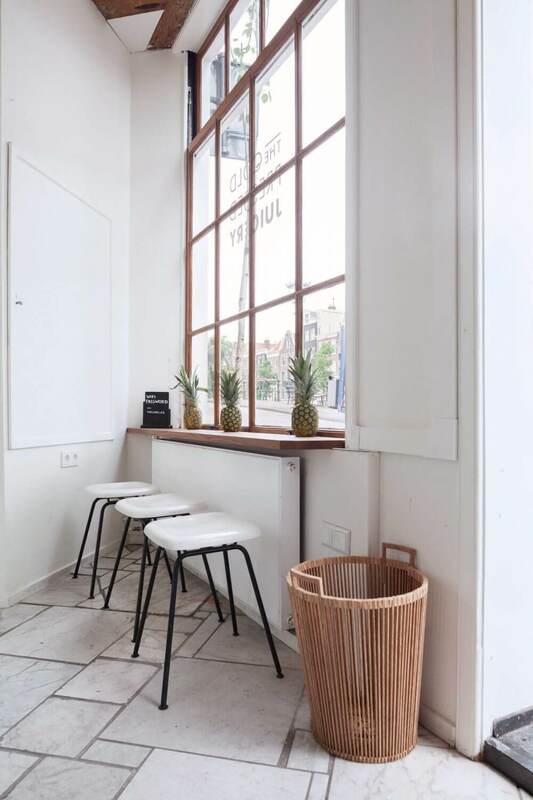 Located opposite the Anne Frank museum, right in the corner where the busy Prinsengracht meets the calm and peaceful Bloemgracht. Every morning the street is full of cyclists rushing to work and during the day the tourists will appear, trying to find their way around or simply enjoying the beautiful city. 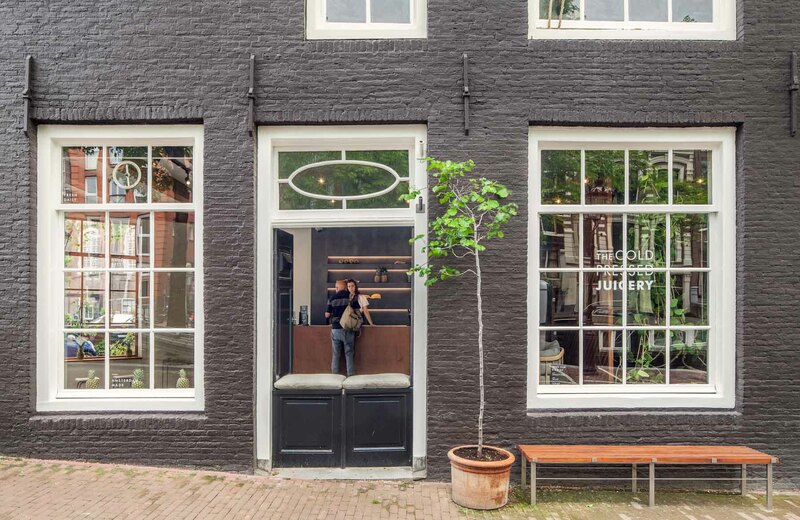 Housed in a historical building, where Rembrandt produced his final painting, the triangular exterior not only mimics that of New York’s Flatiron Building but also the diagonal pattern used on the brand’s bottles. The layout has made it possible to create two different worlds. At the front we have the entrance to the Prinsengracht, a canal with so much happening that life never stops. 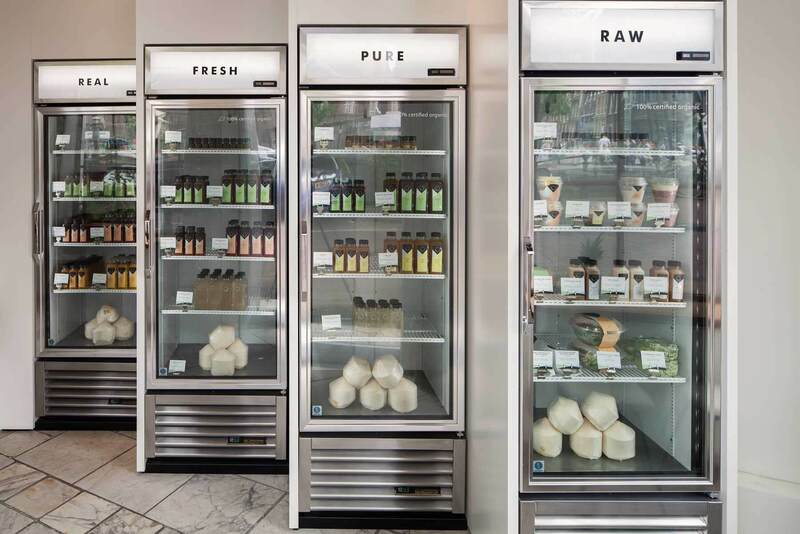 As you enter you will notice how Standard Studio has kept the characteristic of the marble floors, where the fridges are located, containing the “take away” products. 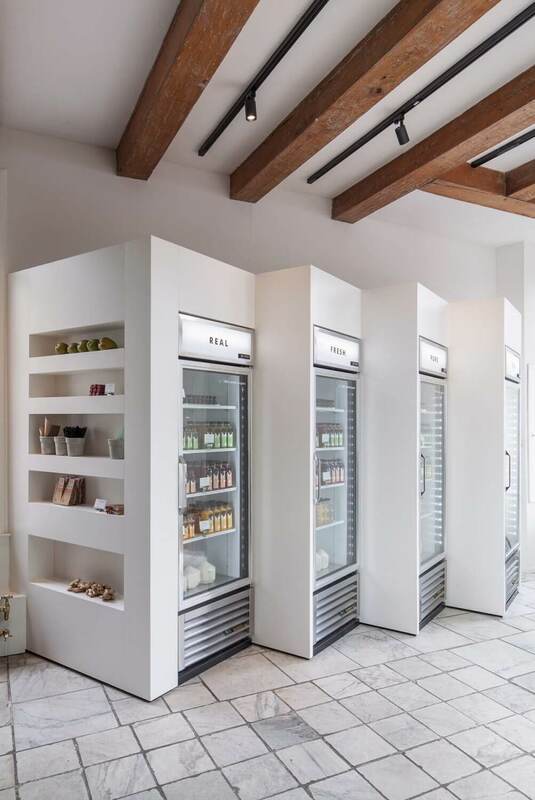 The fridges are set up in a way that has been inspired by the intersection of both canals following two different directions. Commuters in the morning pop in for a few minutes, go straight to the fridges, grab their juices, and off they go to work. The calmer world is at the back of the store. This area is elevated by a few steps and is designed as a clean modern concrete box that is shoved in the monumental house. 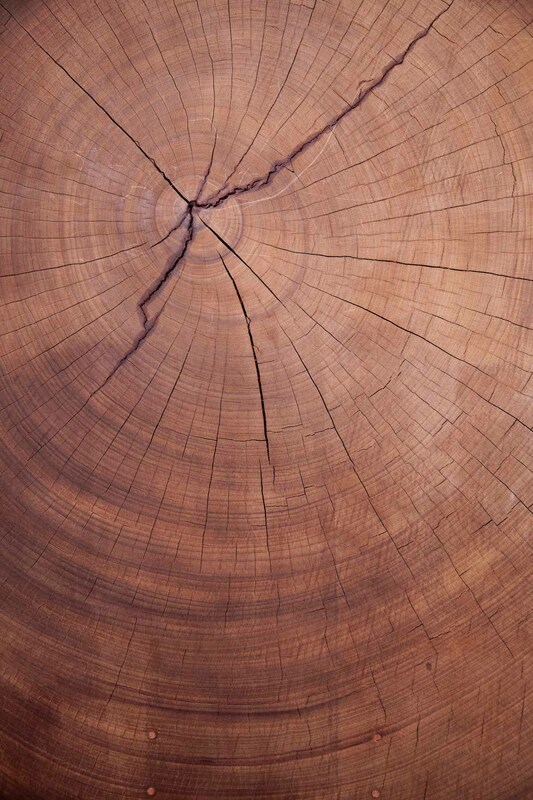 The contrast in material and in height creates the division between both worlds. 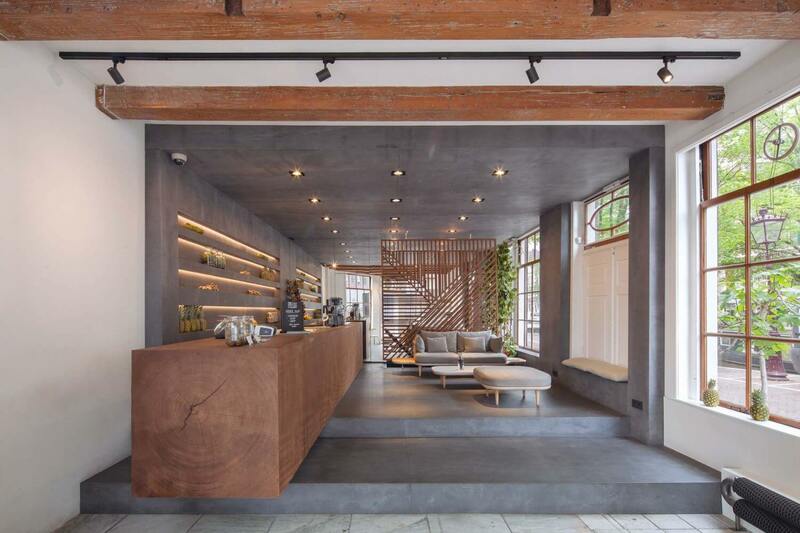 A very calming and relaxing atmosphere has been created thanks to the possibility of having the space for cosy living room setting, the addition of some plants and the pretty view onto the Bloemgracht. For a strong spatial effect a mirror is used in the back to make the space look bigger and brighter. 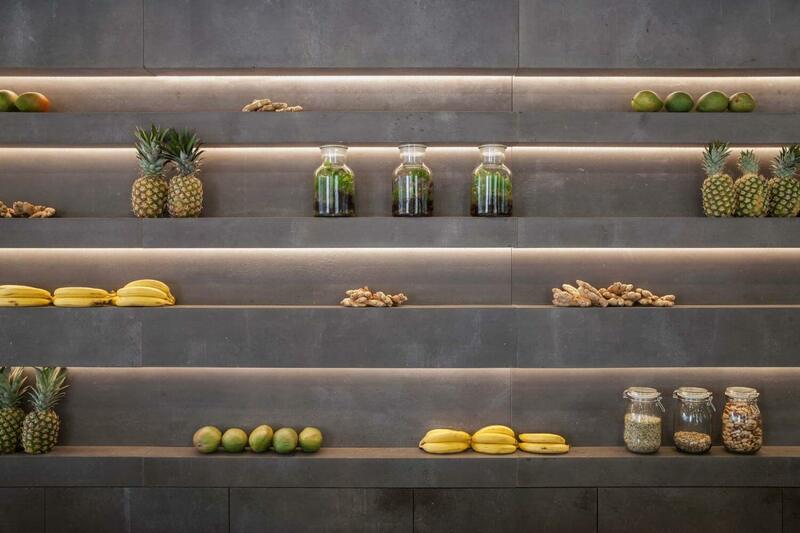 In every Juicery there’s a green element, in the first store it was the green tiles, in the second store Standard made use of a living tree growing in the interior. 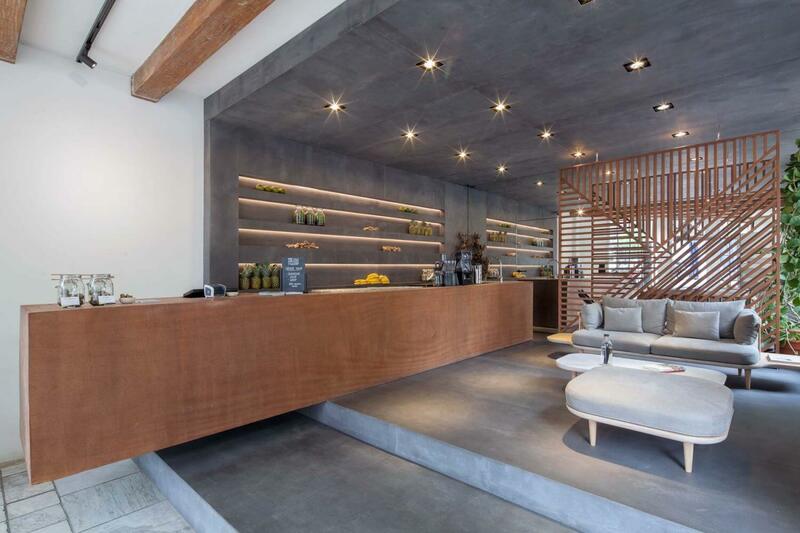 For this new store they worked with a huge sipo mahogany tree trunk that connects the two worlds, and houses a smoothie station and the cash desk. 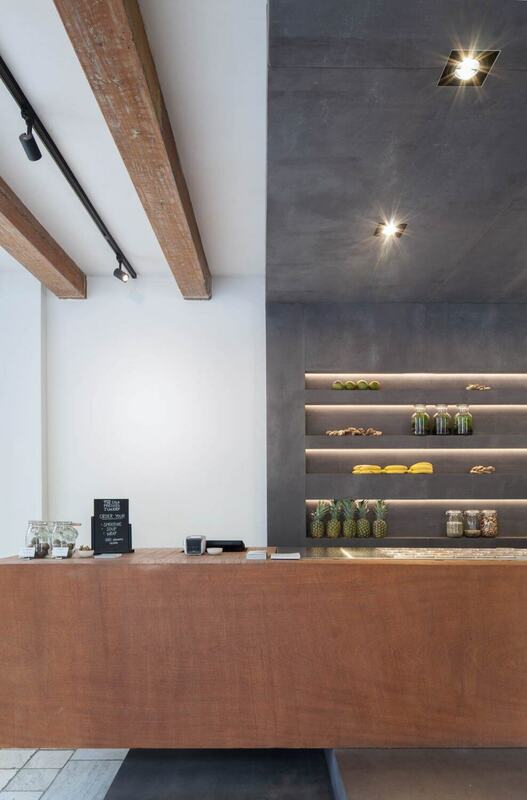 This 5,5m counter was made entirely out of a solid wooden beam weighting over 4000 kg’s. 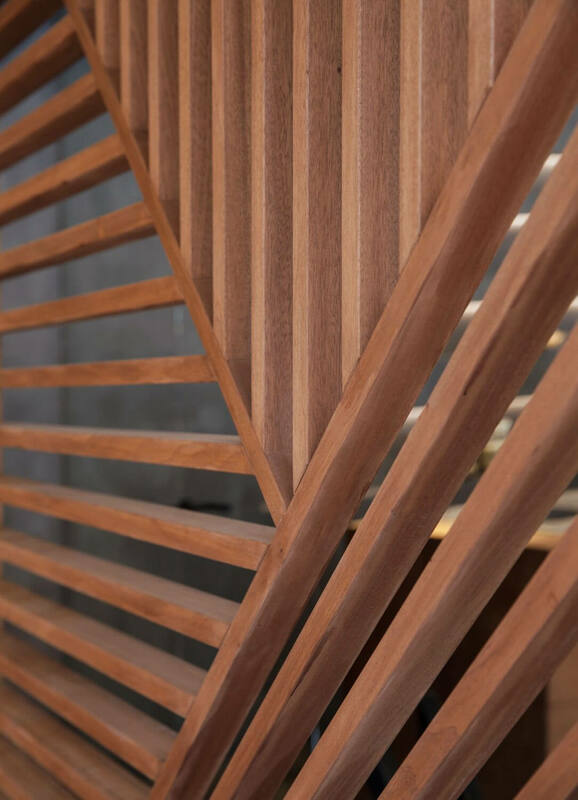 After hollowing the solid beam, they made a screen that refers to the graphic identity of the brand which was made by Build in Amsterdam. 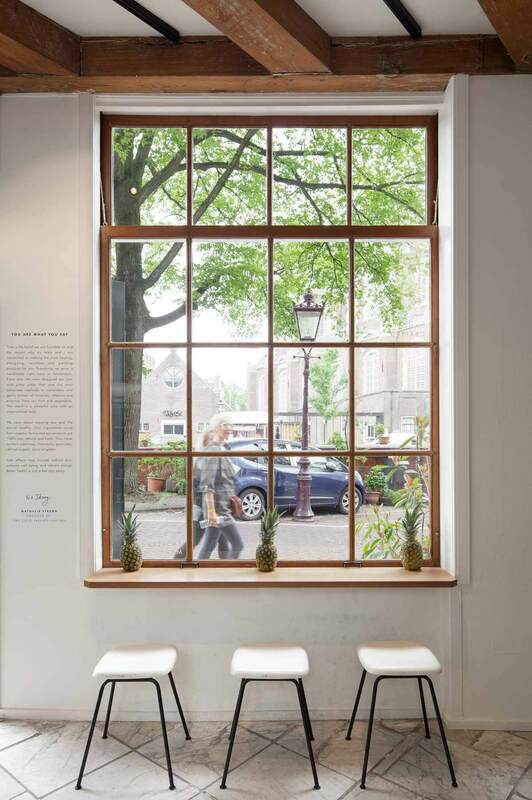 The spare wood was also used to create window sills and benches outside. 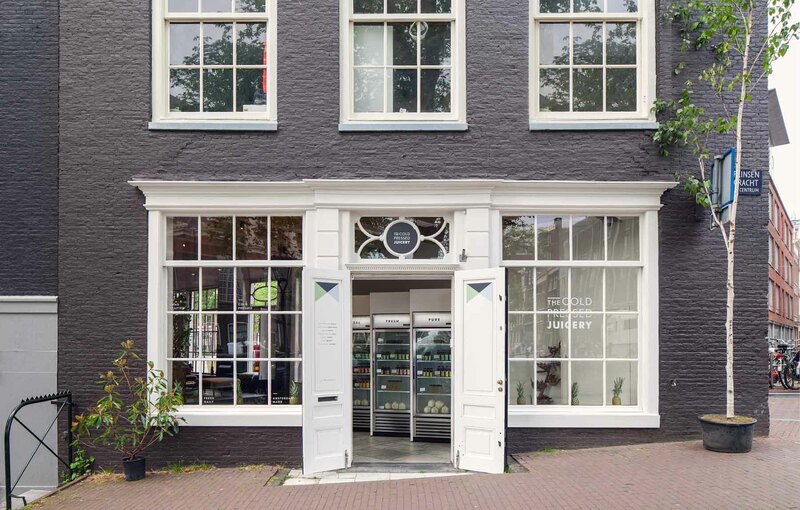 If you find yourself in the center of Amsterdam, stop by and grab a juice at The Cold Pressed Juicery, and if you need to take a break just pop into the back of the store where you will find enough space to relax and enjoy the beautiful sight both of the inside and outside world.